The showers, bathtubs, and tile in our bathrooms are one of the trickiest things to keep clean. Within days of a vigorous cleaning of the bathroom, the grime, and stains, and filth are already accumulating. After all, our bathrooms are one of the most heavily used parts of our homes (at least hopefully)! Investing from time to time in professional services will help your bathroom maintain the look it had when you saw it brand new for the first time. Below are two main issues regarding bathrooms that Made New Again is here to help you with! Over time stains and grime will build up on tile flooring, especially in the cracks. 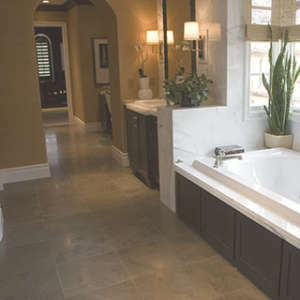 Grout is difficult to keep clean and almost everyone knows the feeling on scrubbing for hours on the hands and knees. A lot of this is the natural course of things and can’t be prevented. Think about it, our bathrooms are directly where we head when we are our most dirty. However, there is one trick that will help minimize the filth that accumulates on the tiles. When your tiles are originally laid and grouted, a residue of grout will be left on your tiles. The trick is to buff off this leftover grout. This leftover film is almost invisible so a lot of people miss it, but it will save you a lot of hours of cleaning to buff this leftover film off. To remove some of the more potent stains on your tile floor, stronger, heavy-duty professional cleaners are required. The chemicals in these cleaners can cause burns and noxious fumes if not handled properly. If opting to clean it personally be sure to take care to use wise safety procedures including wearing gloves and ensuring the area is well ventilated. Soap scum, bath oil, hair products, and body soil all work together to turn your shower and tub into a mess in need of almost constant attention. Tub rims, fixtures, and faucets provide perfect hiding places for mildew and mold. Another recurring problem in showers and tubs is hard water stains. There are no health risks when it comes to hard water stains, but the minerals the water contains stick to everything and leave an undesirable residue all throughout the affected area. Over time, hard water stains can actually damage your home and cost you money. This will all quickly accumulate over time. If not cleaned right away the grime and filth harden and spreads turning a short cleaning job into a rigorous one. Keeping a bathroom clean is hard work. It requires constant, tireless upkeep and persistence. Even with that upkeep and persistence, it is oftentimes still not enough. To prevent the exhaustions and frustration that comes from this chore, look no further than Made New Again as we are devoted to exactly what our name states. Leave the mess to us and we are here to help you make your bathroom look brand new again!